A lot of fuss has been made about the magic Ctrl+Shift+L command in Photoshop lately, but there are some images that simply need more work to really represent reality properly. 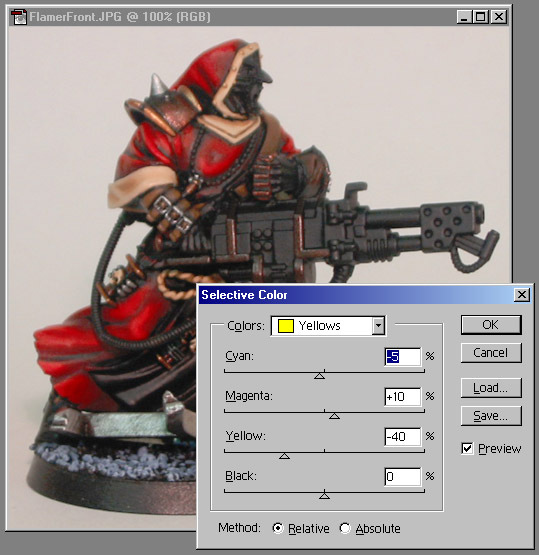 Today I'm here to try and show off an often overlooked feature of Photoshop: Selective Color. This nifty little tool allows you to select certain areas of the spectrum in your image, and quite simply allows you to change it to whatever hues you want. Here's an example. 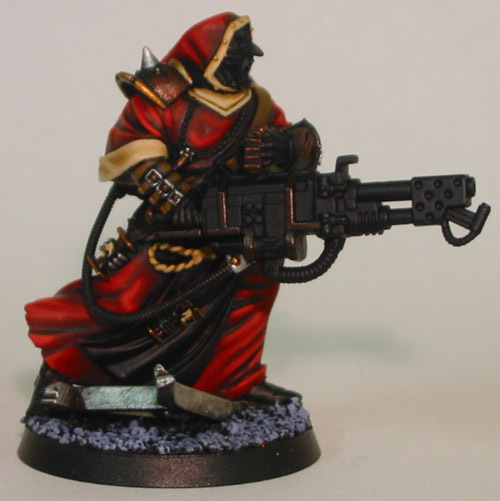 Take my WIP Redemptionist for Inquisitor... nice fiery red robes accented by a gentle bone color. In reality, it's a nice clean color. 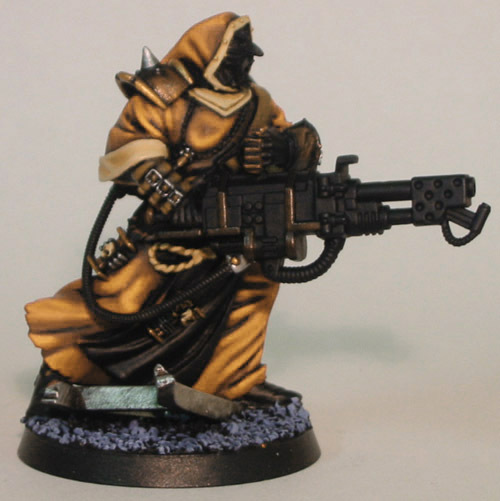 But in the image (appropriately named "Before") it's way too yellow for my liking. Auto Levels won't take care of this little problem, as it's related to the auto white balance program in my camera not the light levels of the image. So we turn to Selective Color tool [interface seen in "During" (Note: This is the interface from Photoshop 5.0, it may look and function slightly different in other versions.)] and enter the yellow area of the spectrum. Toss some of the yellow, boost some of the magentas, and skim just a little off the top of the cyans and viola! Perfect match to the real thing. This tool is also useful for doing slightly less subtle retouching. You can use it to test hypothetical color schemes as well. Just grab one of your minis with the same hilighting style you plan on using, select the area of the spectrum you want to swap out, and go nuts!